Along with the William Crooks, the first steam locomotive of the Great Northern Railway, Northern Pacific Railway’s steam locomotive Minnetonka now rests fully restored inside Duluth’s Lake Superior Railroad Museum within the historic 1892 Union Depot. 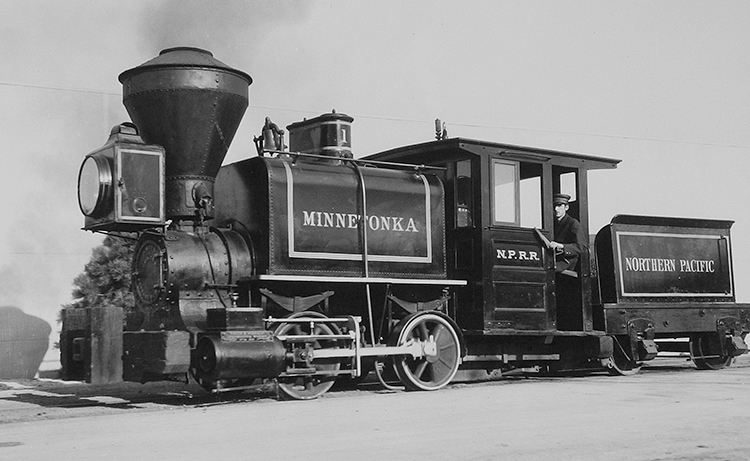 While the Crooks certainly played a more glamorous role for the GN, the NP’s Minnetonka has its own unique story to tell about the early days of railroading in Minnesota—and America. Some of the earliest steam locomotives in the United States were small, vertical boiler 0-4-0 models made during the 1830s. The engines had just four driving wheels for traction. Lacking good suspension systems, they rode roughly on the crude track systems of the day and pulled just a few cars at a time. By the early 1840s the somewhat larger 4-2-0 and 4-4-0 engines were being built with better, equalized suspension systems that provided a smoother ride. They also had horizontal boilers that created the “American” look for steam locomotives. This type of locomotive was known as a saddle tanker. The saddle tank is the large box straddling the boiler that carries the name Minnetonka. That tank is where the boiler water was stored. Since all of that weight was carried over the driving wheels it helped to dramatically increase the pulling power of the little 0-4-0. Originally this locomotive was without tender. As built by Smith & Porter, wood was to be stacked at the rear of the operator’s cab. The tender was added after 1886 to carry more fuel and extend the operating range of the locomotive. The Minnetonka burned wood to heat boiler water that created steam for motion. The large smoke stack was actually a giant spark arrestor that captured burning embers to prevent forest fires as the little engine chugged down the track. The headlight was a large kerosene lantern. These larger locomotives became popular with the railroads. Eventually, a revised version of the 0-4-0 came along that featured these new design features—an equalized suspension and a horizontal boiler—making it ideal for switching applications and hauling materials short distances. These revised engines carried water and fuel onboard without a trailing tender, so the entire weight of the engine and its supplies were carried solely by the driving wheels. This greatly increased tractive effort—pulling power. The Northern Pacific Railway (NP) was able to speed up construction of its lines in July 1870 with the purchase of four such 0-4-0 locomotives built by Smith & Porter in Pittsburgh, Pennsylvania, each named for a Minnesota community. The first carried the number 1 and was named Minnetonka. Her three sister engines were named Itaska, St. Cloud, and Otter Tail. All of these locomotives were purchased to pull supply trains along with the men and equipment that would ultimately create the NP. According to NP documentation, the Minnetonka arrived in Minnesota just a few weeks after westward grading of the railroad’s transcontinental line had begun from a point near Northern Pacific Junction—today’s Carlton, Minnesota. On arrival the Minnetonka was immediately pressed into construction service in northwest Minnesota. When the line reached as far as Brainerd late in 1870, the Minnetonka was drafted for similar service in the Pacific Northwest where the NP had started building its line coming east. Her long journey began in 1871. The locomotive was shipped by rail to San Francisco and then by boat to Kalama, Washington. She was used in construction service from Kalama to Tacoma and later from Ainsworth to Spokane, Washington. The Minnetonka remained on the western end of the NP system until 1886 when she was sold to lumberman B. B. Turner and delivered to him at Olympia, Washington. Turner added the small fuel tender behind the locomotive to extend its operating range—likely a good reason why the Minnetonka would out-live her siblings. He used the locomotive in logging operations in the vicinity of Olympia, but in 1889 she became the property of the Port Blakely Mill Company. The new owners used the locomotive in the construction of the Puget Sound and Grays Harbor Railroad, a logging line between Kamilcho and Montesano, Washington. It was also used in the work of extending spurs, tearing up old spurs, and in the transportation of men between the camps and their work in the woods. This operation continued until 1895 when the Minnetonka was sold to the Polson Logging Company at Hoquiam, Washington. At Hoquiam the Minnetonka became the “Queen of the Polson Railroad,” but was more affectionately known as Old Betsy. She survived a devastating 1902 forest fire that swept through a portion of the woods near Hoquiam while stationed along the middle fork of the Hoquiam River. After that exciting brush with potential extinction she continued hauling logs steadily until 1906 when she was put on work gang detail—her last assignment before being retired in 1928—while still being sound and in good working condition. About this time, railroads began making plans for the 1933 World’s Fair in Chicago. Rival Great Northern (GN) would surely bring their famous William Crooks to center stage at the event. NP executives felt their railroad deserved no less attention and soon enough their operating department officers decided to look for survivors of their original class of steam locomotives. After a lengthy search, the Minnetonka was discovered intact sitting in the woods near Hoquiam and was sent to St. Paul for restoration. None of her three sister locomotives remained. The little engine became an ambassador for the railroad appearing in community events. Just like the GN’s William Crooks, it too appeared before vast audiences of people who attended the Chicago World’s Fair Century of Progress Exposition in 1933–34 and the New York World’s Fair in 1939–40. It even operated under its own steam at “Wheels-A-Rolling,” the Chicago Railroad Fair Pageant of Transportation Progress in 1948. Ownership of the locomotive transferred from the NP to Burlington Northern (BN) in 1970 when NP merged into that line, and transferred yet again to the BNSF Railway in 1995 when BN and Santa Fe joined forces. When the Lake Superior Railroad Museum opened, Old Betsy was placed on display inside the building on long-term custodial loan. But believe it or not, the old girl’s travels weren’t finished just yet. The railroad actually took the engine back for display at their headquarters for a time. At Duluth, she was put on a flatbed truck, securely tied down, then wrapped in tarps to protect her during the snowy, slippery mid-winter journey along Interstate 35. Happily, and without mishap, the Minnetonka was eventually trucked right back into the Zenith City. Like the William Crooks, the little locomotive is a true cornerstone character of Minnesota’s earliest railroad history. Together, Old Betsy and William Crooks enjoy quiet retirement in Duluth, right next to each other, exactly where they should be.